Enterprise bargaining in the capitalist industrial relations legal system in Australia came to center stage in the class struggles of the 1990s. Now it is being questioned by both big business and the unions, albeit for different reasons. Big business says it now limits their "flexibility" while unions say it isolates workers and reduces workers’ collective bargaining capacity. Initially it was supported by big corporations, both major parliamentary political parties, the ACTU and major manufacturing unions. Some workers made real gains in pay and conditions by using the limited and contracting legal right to take collective industrial action or have the ability to take such action. 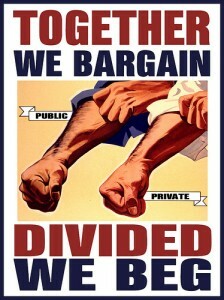 Some corporations used enterprise bargaining to drive down working conditions in exchange for the appearance of above average wage increases. In the mining boom years before 2008, wage outcomes in some mining and manufacturing sectors reached 5% increases for year. The gap in wages and wage increases between workers in some mining, construction and some manufacturing industries, and workers in other industries where workers did not directly produce surplus value widened. In the Howard Government's Work Choices years, corporations' use of the enterprise bargaining system to attack working conditions intensified all in the name of "flexibility". Removal of RDOs, more labour hire and lower wage outcomes characterized enterprise agreements over the last decade. The exceptions to this have been enterprise agreements in large to medium sized corporations in industries with increasing production due to export growth markets in Asia in particular. For example, in food and beverage industries larger corporations have been mainly concerned with stable, dispute-free work forces to ensure continuous supply of product and profits from their overseas markets. However, in these growth industries, new capitalists including multinational corporations look for a piece of the export action. They buy into the industries through corporate takeovers or set up new plants and compete on price by hiring workers on minimum award conditions "free" of the "burden" of "union interference " in their business! The larger corporations with unionized work forces built up through years of struggle are seriously considering the option of terminating enterprise agreements and turning back time to the award system as the determinant of pay and conditions. How do they hope to get away with this? They network at industry forums and business councils led by the Business Council of Australia and look for the weak links within the work forces of their particular industry. They look for businesses within their industry that are poorly unionized or businesses where workers have an enterprise agreement but are alienated from the whole process through years of concession bargaining with poor wage outcomes, or where their workplace exists in a region with high unemployment and/or low paying jobs. They back these businesses to 'test the water' and put in applications to the unFair Work Commission to terminate enterprise agreements. They seek majority support from their existing workers to terminate the agreements by preserving the above-award pay and conditions of their existing permanent workers. However new workers in the business are hired on the minimum award pay and conditions. Capitalists attempt to create confusion among workers by saying that the award is an industry standard and "less complicated" than going through an "arduous" enterprise agreement negotiation every three years or so! The unFair Work Commission presides over this process and invariably terminates the enterprise agreement. Over time with turnover of workers there is a decline in wages and increase in surplus value and realization of profits. Every case of this happening encourages other capitalists in the same industry to follow with an overall reduction in the real wages and increase of average surplus value and profits in the industry. The Commission is also frustrating workers by delays of over 6 months in deciding whether to approve some agreements that workers and their unions have won. Where workers are well-organized, the attempts by the big corporations to go down the path of terminating agreements can be defeated. However, make no mistake - it is on their agenda. Perhaps the ACTU's messaging in their Change the Rules campaign should include "DEFEND AND EXTEND COLLECTIVE BARGAINING" to avoid confusion when bosses tell their workers that collective bargaining at the enterprise level is too complicated now and that to avoid lengthy delays and "interference" by the unFair Work Commission it is best to go back to the industry award standard of a "level playing field"! Of course, what the bosses leave out is that the "level playing field" of the award they are talking about has been stripped to the bone over the last 20 years!